An Axiom is a mathematical statement that is assumed to be true. 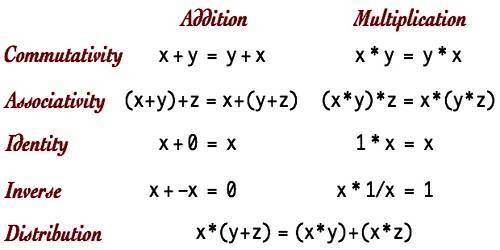 There are five basic axioms of algebra. Axioms are generally statements made about real numbers. Sometimes they are called algebraic postulates. The axioms are the reflexive axiom, symmetric axiom, transitive axiom, additive axiom and multiplicative axiom. Additive Axiom: If equals are added to equals, then the sums are equal according to the additive axiom. If a = b and c = d then a + c = b + d. If two quantities are equal and an equal amount is added to each, they are still equal. These 5 basic properties are known truths of algebra. Essentially, they guarantee that numbers equal to the same thing are equal to each other, and that adding an equal number to those 2 equal numbers will result in 2 equal sums.